101 Site Hosting is well known for a number of web hosting products. However, 100 Best Free Web Space feels 101SiteHosting’s email hosting stands out above other web hosts that offer email hosting. 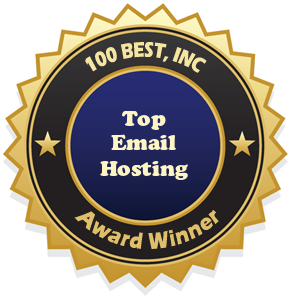 Therefore, we are proud to announce we have decided to award them our “Top Email Hosting” award. The 101SiteHosting Starter Package includes everything you will need to build your own website including a web based site builder and complete Installatron library of easy to install scripts. With these two web hosting tools there is no need to hire a webmaster to create your website, you can do it yourself (even without a knowledge of HTML). At ONLY $29.99 a YEAR the 101 Site Hosting Starter Package is an excellent deal even if you are just looking for a good web host for your email accounts. This shared web hosting package includes a number of FREE email hosting tools to help you manage your email including free email accounts, free spam filtering, free POP/SMTP email access, free webmail accounts, and free auto-responders. The 101SiteHosting webmail allows you to send and receive emails from all around the world. Well, at least where you can get Internet service. With POP/SMTP email access you can choose to use your favorite email management system to check, send, and store your email on your computer. The free auto-responders can be set to “auto respond” to emails you receive while away to let your friends, family, and clients know you have received their email but will respond at a later time/date. And with free nightly backups you do not have to fear losing all the emails you have stored on your personal computer when you have a power surge and lose your hard drive. When hosting your site with 101SiteHosting you can rest assured that your web site is being hosted in a secure place, on top of the line servers, and is backed by great web hosting support. All 101SiteHosting products are also backed by a 90 day money back guarantee. This entry was posted in Uncategorized and tagged 101 site hosting review, top email hosting, web hosting awards. Bookmark the permalink.